Have you ever thought this scene: Open phone, I can see the current barometric pressure or motion acceleration. the Xadow module can help you achieve this. If you have learned to achieve Demo 1 and Demo 2, you just need to connect the Xadow Main Board, Xadow OLED, Xadow Accelerometer and Xadow BLE Slave modules and download the code:BLE_Slave. Now you can open BLE_Slave INO file, compile and upload. If you are just starting to use, please install Xadow driver referring to here. And ready to download the library:DigitalAccelerometer_ADX345 and sleep_FromArduino and put them on the libraries file of Arduino IDE by the path: ..\arduino-1.0.1\libraries after unzip._ Now you can open your phone's bluetooth for observing data. When the accelerometer value is changed, then the bluetooth serial will display real-time data. Note that your phone's bluetooth should be bluetooth 4.0 (iphone4S or above)and you need to download bluetooth serial tools. For more information, please refer to the usage of Xadow BLE Slave. 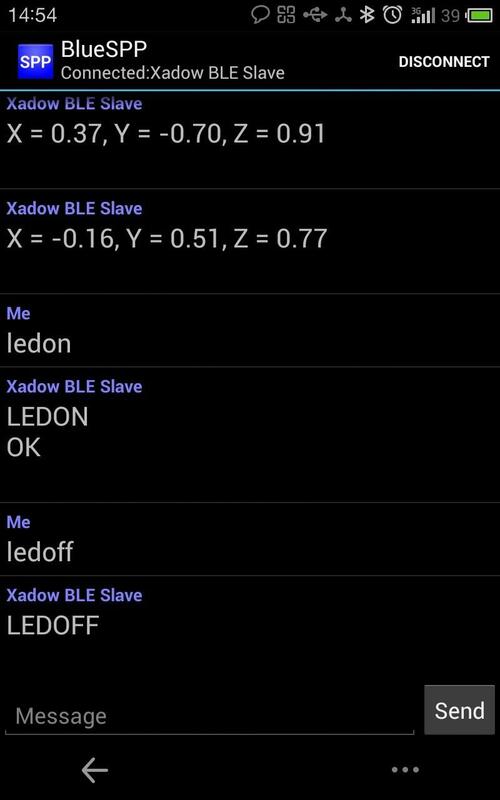 You can see there are two commands(ledon and ledoff) in the phone screen. They are used to control the GREEN indicator state. Have a try!